Winter’s right ’round the corner, so I thought I’d post a shot from last winter. High on a mountainside in the Wrangell Mountains the wind had swept the snow into some really cool patterns of ridges and valleys. I loved the curves in this scene, and with some nice dramatic side-lighting right before sunset (around 2:30pm), this scene was cooler than cool. Cooler than being cold, in fact. For scale, you can see a lone spruce tree in the background, shaded by the rising ridge beyond it. Funnily enough, the temperature up on the hillside was markedly warmer than down at the Shack. Everytime I ventured up on to the mountains, the temperature was noticeably warmer. Folks tell me the inversion is simply because warm air rises and cold air drops, so down into the Kennicott River basin it goes. This doesn’t seem to happen quite the same way in warmer temperatures, though, when the mountains are much colder than lower altitudes. it’s tricky stuff. “Press close, bare-bosm’d night. Press close, magnetic, nourishing night! Still nodding night! mad, naked summer night! Earth of the limpid grey of clouds, brighter and clearer for my sake! Far-swooping, elbow’d earth! rich, apple-blossom’d earth! Smile, for your lover comes!” – Whitman, “Leaves of Grass”. This entry was posted in Abstract Photos, Adventures, Alaska, Art, Landscapes, Skiing, Winter, Wrangell - St. Elias National Park and tagged black and white, patterns, snow, Winter, Wrangell - St. Elias National Park, Wrangell St. Elias on October 28, 2009 by Carl D.
Hey Carl, I love the windblown smoothness to the snow in this image. Certainly the tree portrays messages of fragility, survival, and scale. Good stuff. I think this is probably my favourite image from all your landscape shots I’ve seen. B&W is such a cool medium for landscapes when nailed properly – as this one clearly is. Truly spectacular! That is one heck of a COOL shot!! I have to agree with Peter about this being my favorite of your landscape shots as well!! Often times when I feel that the light isn’t optimal to bring out the beauty of a place, I try to visualize how the scene would look in B&W. Sometimes it works and some others it doesn’t. But you’ve nailed it here!! Excellent work! Just out of curiosity and to rekindle the fire in you about RAW converters ;), did you post process this in Capture NX2? Lovely image, Carl! 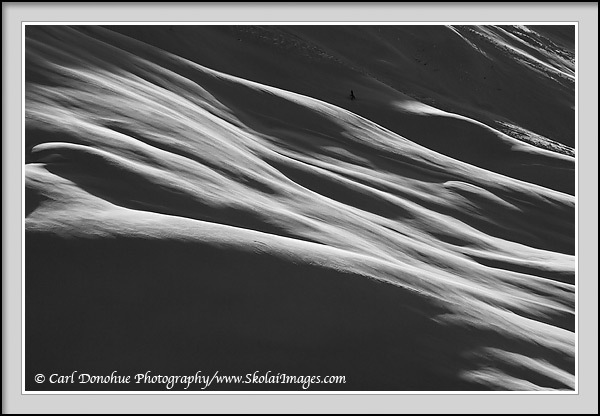 I really like the smoothness of the snow, the abstract quality, as well as the black and white presentation. Top marks from me!